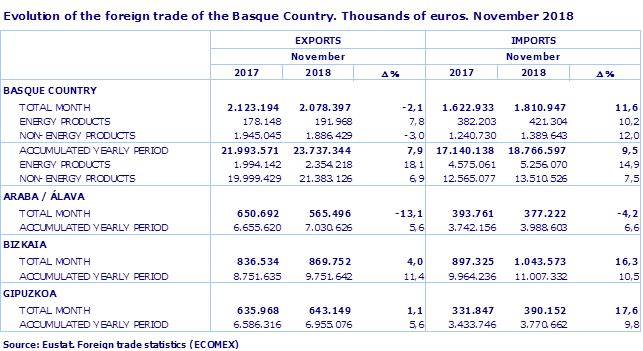 Exports of goods from the Basque Country registered a slight annual downturn of 2.1% in November 2018, according to EUSTAT data. This decline was due to the drop in exports from the customs duty group Transport Material, which was down 17.6% (112 million less than in November 2017). As a whole, the total exported was 2,078.4 million euros compared to 2,123.2 million in the same month of the previous year. Álava is the province that accounted for the decrease (-13.1%), due to the drop in both exports of Transport Material (-24.0%), which this month represented 54% of this province’s total exports, and Cement & Glass (-20.9%). The other two provinces compensated, in part, for this decrease with growth of 4.0% in Bizkaia and 1.1% in Gipuzkoa. Imports of goods to the Basque Country experienced an 11.6% rise, reaching a total of 1,810.9 million euros. Energy imports increased by 10.2% and non-energy imports were up by 12.0%. Imports for Gipuzkoa grew by 17.6%, and for Bizkaia they were up 16.3%, whereas they dropped by 4.2% for Alava. Analysing the 48 largest activity branches(A86), and in relation to exports, standing out this month were the increases in exports of Rubber products (89.6%), Electrical Material & Equipment (23.7%) and Iron and Steel products(6.9%), in addition to the decrease in exports of products related to Manufacture of motor vehicles (-21.0%), Machine Tools (-25.8%), Metal products (-13.5%) and General use machinery (-9,2%). Rubber products, the sixth largest this month, saw considerable growth, more than double, in Bizkaia. Manufacture of motor vehicles (first in the ranking) fell considerably in Bizkaia (-23.6%) and above all in Álava (-25.0%). A more detailed look reveals year-on-year falls in exports of what are traditionally the five largest customs duty groups: Passenger cars with between 5 and 10 seats (-31.2%), Vehicle parts and accessories (-10.8%), Goods transport vehicles (-22.2%) and Petroleum Oils (-8.1%). Even so, these groups accounted for 25.7% of the total in November 2018, with a combined value of 533.9 million euros. This month five countries (France, Germany, United States, United Kingdom and Italy) are our main clients, absorbing 52.5% of total exports from the Basque Country. Four of them belong to the EU 28, an entity that accounts for 68.3% of exports. Analysing imports by branches of activity, it can be observed that the largest, Extraction and Petroleum Industries (22.6% of the total) saw an increase of 15.7%. Other large branches also registered growth: Iron and Steel products (20.2%), General use machinery (11.7%) and Paints and other chemical finishes (30.7%). Foreign trade in goods in the Basque Country during the first eleven months of 2018 had a positive balance of 4,970.7 million euros, 117.3 million more than that registered during the same period of the previous year, which represents a coverage rate of 126.5%. This rate is over 100 (exports exceed imports) in respect of nearly all EU 28 countries. In relation to Germany it is 133.3% and for France and the United Kingdom it stands at 204.0% and 226.9% respectively. For the first eleven months of 2018 as a whole, Basque Country exports registered an increase of 7.9% compared to the same period of the previous year (1,786.6 million more), which translates into an increase in the trade balance of 117.3 million euros compared to that registered in the same period of the previous year. Bizkaia exports, during the period in question, were the largest in the Basque Country, with a total of 9,751.6 million euros and growth of 11.4%. In Álava growth stood at 5.6% (7,030.6 million euros) and in Gipuzkoa it was 5.6% (6,955.1 million euros). Considering the type of product, it was Non-energy products, with an increase of 1,383.7 million, which accounted for the majority of the aforementioned growth, whereas Energy products contributed 360.1 million, all in nominal terms. Of the 25 largest branches of activity (A86) by export volume, 19 saw sales increase and only six registered decreases for the first eleven months of the year as a whole. Amongst the most important groups, the growth of products related to Iron and Steel products particularly stands out (21.2%), exceeding that exported during the same period of the previous year by 448.6 million, to stand at 2,562.3 million euros. There was also significant growth in exports related to Coke Plants & Oil Refining, up 21.7%, and Rubber Products, with an increase of 22.3%. In turn, the branch with the highest volume of exports was that of products relating to Manufacture of motor vehicles (5,867.5 million and 24.7% of the total), which grew by 4.7%. The export ranking of the first eleven months of 2018 situates Germany as the prime receiver country of Basque exports, with 15.3% of the total exported. Germany is followed by France (15.2%) and the United States (8.2%). 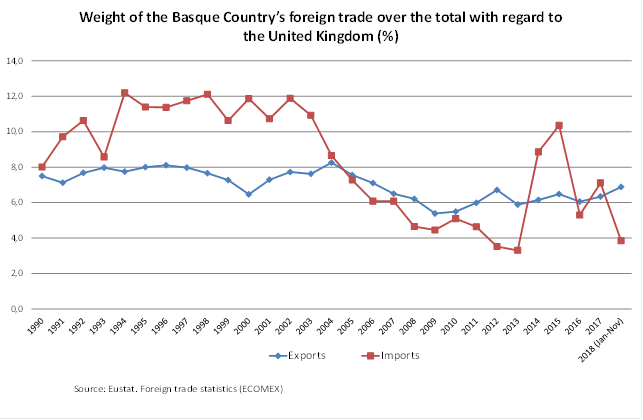 These three countries account for almost 38.8% of Basque exports between them. Accumulated imports for the Basque Country as a whole until November 2018 amounted to 18,766.6 million euros. Comparing this figure in year-on-year terms we see that it represents 1,626.5 million more than that registered in the same period of 2017. Bizkaia made the highest contribution, 1,043.1 million euros (64.1%), to the aforementioned increase in imports, followed by Álava with 246.5 million and Gipuzkoa with 336.9 million. Imports of Energy Products rose by 14.9%, with those of Non-energy Products doing so by 7.5%. For the first eleven months of 2018, as a whole, exports to the United Kingdom continued to be significant (1,633.5 million), representing 6.9% of the total; a figure very close to the average of the last 28 years (7.0%). This percentage takes it to fourth place in the country ranking, which is topped by Germany (15.3%), France (15.2%) and the United States (8.2%). The United Kingdom has always occupied one of the top positions in the export ranking: third, fourth or fifth place. In this same period, imports from the United Kingdom (719.8 million) accounted for 3.8% of the total, a percentage that it is below the historical series average, which began in 1990 and stands at 8.5%, with periods (1994 to 2003) in which it has been between 10.6% and 12.2%. Currently, the weight of British exports places the United Kingdom in seventh place in the import ranking, during the period considered, behind countries such as Germany (14.6%), France (9.4%), China (5.7%), Italia (5.0%), México (4.4%) and Libya (4.0%). In 1994 and 1995 the United Kingdom did in fact occupy second place. As a consequence of this dual flow, exports-imports, there was a negative trade balance from 1990 until 2004, when it became positive. This pattern has been maintained up to the present, with the exception of 2014 and 2015. In 2018 so far, the balance generated a surplus of 913.7 million euros, the coverage rate standing at 226.9%, above the rate registered for countries such as Germany (133.3%) and France (204.0%). Analysing the products traded with the United Kingdom, standing out in terms of exports and for the first eleven months of 2018, were Goods transport vehicles (209.4 million), the main exported product, with 21.7% of the total, followed by, in order: Parts and accessories for passenger cars, goods transport and special use vehicles, as well as Tractors (183.7 million and 19.0%), Iron or non-alloy steel sections, n.e.c (159.1 million and 16.5%), Passenger cars and other vehicles for transporting less than ten people (129.2 million and 13.4%), and New Rubber Tyres (85.1 million and 8.8%). These five products account for 79.4% of the total exports to the United Kingdom over the last eleven months, of which the majority belong to what can be classified, in general, as the vehicle sector. This analysis should be concluded without mentioning the fact that since 2000 these five products have appeared amongst the top Basque exports. The main imported products were, in order of importance: Petroleum oils or oils obtained from bituminous minerals (206.9 million), Ferrous waste and scrap; ingots of scrap iron or steel (64.0 million), Flat, non-alloy iron or steel products, hot rolled >= 600 mm thick, uncoated (34.7 million), Turbo-reactors, turbo-propellers and other gas turbines and parts (32.3 million) and Fresh or chilled fish (22.9 million). These products have also been the most important over recent years (2000 to 2018), alternating in the top positions, with the exception of 2011, 2012 and 2013, when there were no imports of petroleum oils. Attention should also be drawn to another product that, albeit with a more irregular trajectory and since 2004, has always been in the top six, Stainless steel in ingots or other primary forms and semi-finished stainless steel products. To conclude the analysis of imports, we can say that six products accounted for 53.3% of imports.